1. Remove the pastry sheets from the freezer and let thaw for at least 4 hours. 2. Finely chop the spinach and squeeze out as much water as possible. Water in spinach will make the pastry sheets soggy. 3. Finely dice the red pepper. 4. Heat the oil in a skillet. When sufficiently hot add the asafetida and peppers. Cook till peppers are tender. Now fold in the remaining ingredients and sauté till spinach starts wilting. Put off the flame and let the mixture cool. 5. Once cooled add the cheese and mix well. 6. Roll the pastry sheet slightly on a well floured surface. 7. 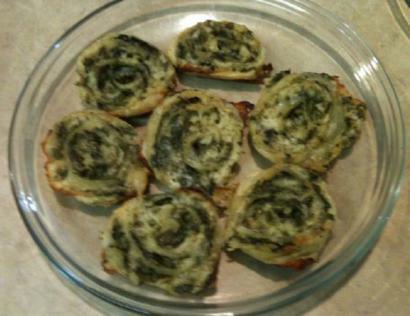 Spread a layer of the spinach cheese mixture on the pastry sheet and roll tightly in jelly roll style. Cut the roll in to slices and bake at 350 F for 15 minutes or till the slices turn golden brown. The roll can also be frozen and used later on when needed. 8. Let cool for 15-20 minutes. 9. Serve with tomato sauce or just like that.